Bucharest is located in the Southern Romania. It is the country’s biggest city, with 2.2 million inhabitants (2012). It was first documented in 1459 AD and inhabited since 500 BC. Bucharest is the Capital of Romania since 1862 AD. It has an elegant architecture built in the period between the two World Wars, reason for which it used to be called the Little Paris. The legend says that the name Bucuresti (Bucharest) comes from a shepherd who founded the town on the Dambovita river, whose name was Bucur (this means in Romanian happiness). 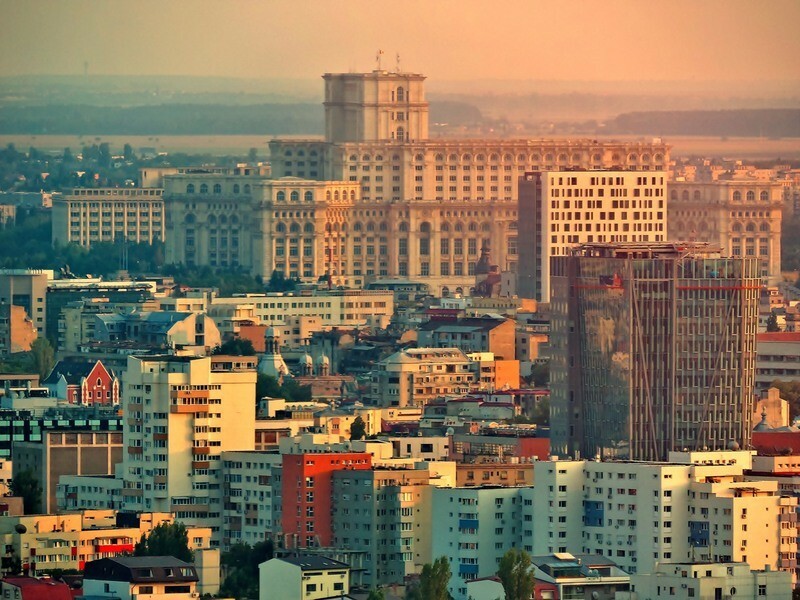 The name Bucharest could also come from the name of the beech forests – Bukovie, other sources link the name of the city with the Albanian name – bukureshti – which means “it is beautiful”. The Old Town is one of the most animated and full of life places in Bucharest. Near the center of the city there is an area with small streets and a big variety of interwar buildings where you can find more than 200 pubs, clubs and terraces. In the weekend evenings everyone is there. It is amazing to see so much people in such a compact area. The pubs have different themes, trying to imitate different cultures and they form a big puzzle of color, music, style and ambiance. The streets are very crowded, and there is always a mass of people moving in order to find the best place to stay. In this part of the city one can find, among others, the National Bank (the first bank ever built in Romania), The Royal Court of Vlad Dracul (Dracula), an old famous street called Lipscani and many buildings that imitate the French style from the beginning of the 20th century. There are also many restaurants, some of them with a clear theme, with traditional food and architecture, and others with elements that bring back to life the interwar atmosphere; many of these restaurants offer live music and an atmosphere full of life. You can read more about them in the tours section. The Old Town symbolizes quite well the mixture of the Romanian Culture, the great mosaic that was created here. The Latin spirit, the oriental (Ottoman Empire) influences and some elements from Western Europe (French architecture, a little bit of Italian fashion style, international music) are quite visible. If you want to feel the tremble of a Latin country and to see the local color you have to visit The Old Town of Bucharest. There is everything for everyone. The city is big and the places to party are many. No matter what kind of style you prefer, you will find something that will perfectly suit you. The offer varies from the glamorous clubs, to the open space ones with pools and palm trees all the way to the ones with live music and karaoke sessions. Bucharest is well known in Europe for the exuberant parties. Lots of people are coming only for the weekends to enjoy the good vibes, to explore the new trends in fashion, to meet beautiful people and to live at a high level. In the middle of the city, between bricks and concrete buildings there are some green oasis full of life and charm that are always bringing a smile on your face. In such places the coffee, tea or lemonade have a different taste, due to the fact that the atmosphere can make everything just a little sweeter. You can see a selection of these places in the pictures. Even if the city doesn’t have thousands of years of history, it does have a rich heritage and culture. There is a long list of landmarks with great cultural value. Further below you can read about some of them. 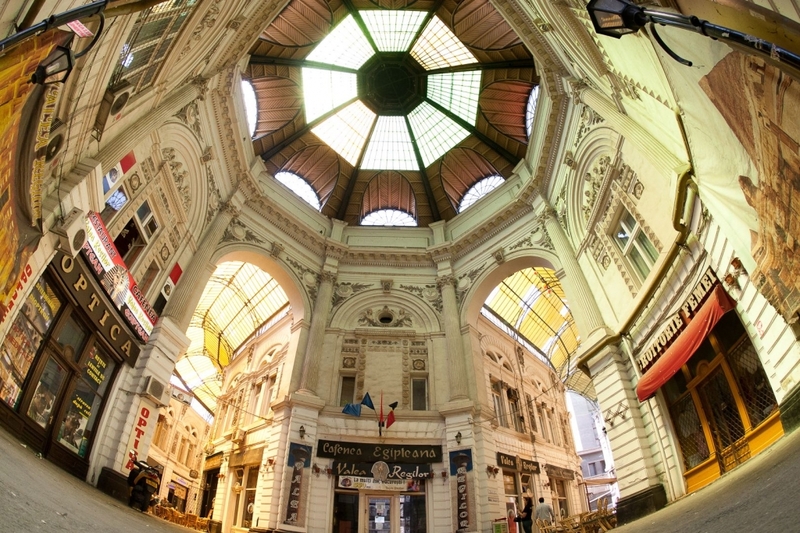 Discover even more information in the tours section, Bucharest days. 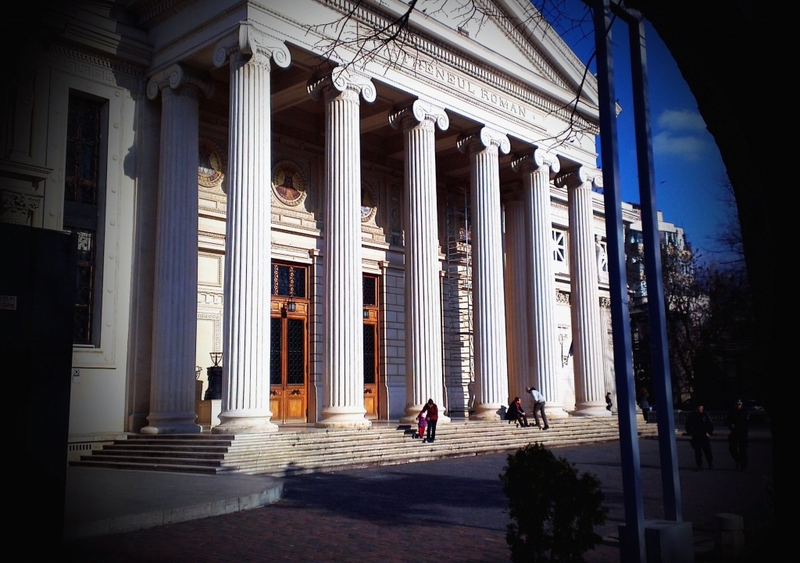 The Romanian Athenaeum is a symbol for Bucharest and for Romania. It has been built in 1888 using money donated by the general public. It was designed by Albert Galleron, the French architect that also designed the National Bank of Romania. The building inspires greatness, and while the architecture is simple, the architect used Doric columns in order to give a shape of a great dome. 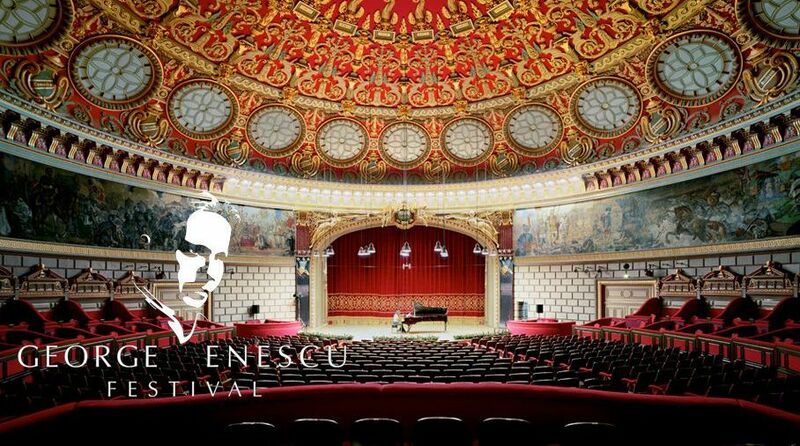 Inside, into the big concert hall, beyond the red cupola, there is a fresco measuring 70 meters in length and 3 meters in width, on which 25 scenes from Romanian history are represented, from the early beginnings until nowadays. Opened in 1888, the ornate, domed, circular building is the city’s main concert hall and home of the George Enescu Philharmonic and of the George Enescu international music festival. Parliament Palace is the heaviest building on Earth, the biggest administrative building as measured surface on Earth and the most expensive administrative building. It was built between 1984 and 1997. It houses both Chambers of Parliament. Very impressive about this building are the facts mentioned below. 700 architects and about 20,000 workers who worked in three shifts, 24 hours a day had participated in the construction. Cantacuzino Palace (Palatul Cantacuzino) is a beautiful house built at the beginning of the 20th century in an eclectic French style. It used to be the residence of Grigore Cantacuzino, one of the wealthiest citizens of Romania. The idea of this beautiful residence was developed during the period when he was a Prime Minister. 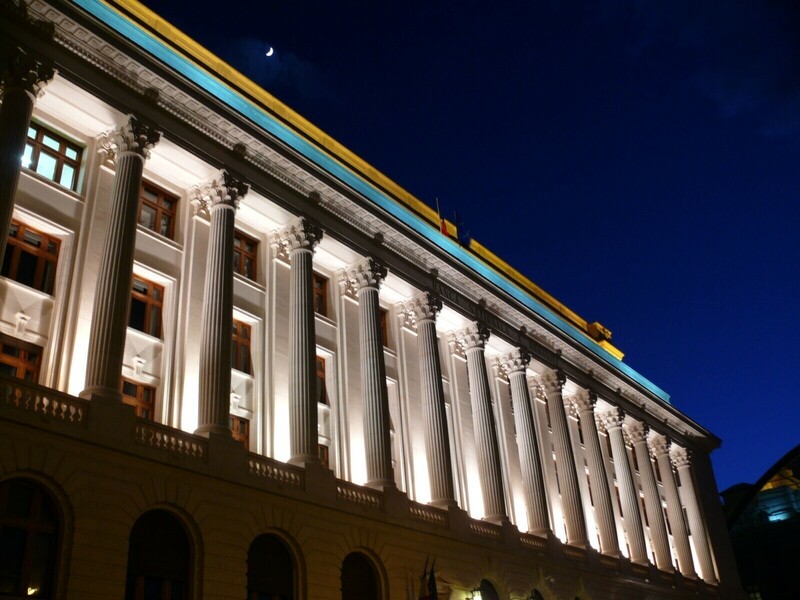 The palace houses today a museum dedicated to classical music – the George Enescu Museum. The composer had lived for a while in this palace. Fragments from the artist’s life and musical work can be seen during a visit to this palace. The Village Museum of Bucharest is an open-air ethnographic collection of old houses, that is trying to rebuild the atmosphere of traditional villages and households from each specific region of Romania. It is spread on a large surface near the Herastrau Park and contains more than 272 authentic houses and farms used by Romanian peasants. It is the largest museum in Europe. Many traditional events are hosted here throughout the year, which are capable of bringing together many artists from all over the country. Those are only a few cultural places from Bucharest, please read our blog and the tours section to find out more. The charm of the big city also comes from its gardens and parks. The biggest one is Herastrau. With a beautiful lake surrounded by lots of green places, tall trees and nice terraces near the water, this is one of the best places in town to spend the sunny days. The landscape is beautiful and the feeling of sitting in nature, away from the concrete buildings is authentic. There are also some terraces that have been built on a few nice pontoons, which allow you to enjoy your meal by being very close to the water. Most of the time the park is filled with people who take a walk or just practice some sports near the shore. Bucharest, The Litle paris, green places, Photo Copyright Gh. Chelu – at Parcul Herăstrău. 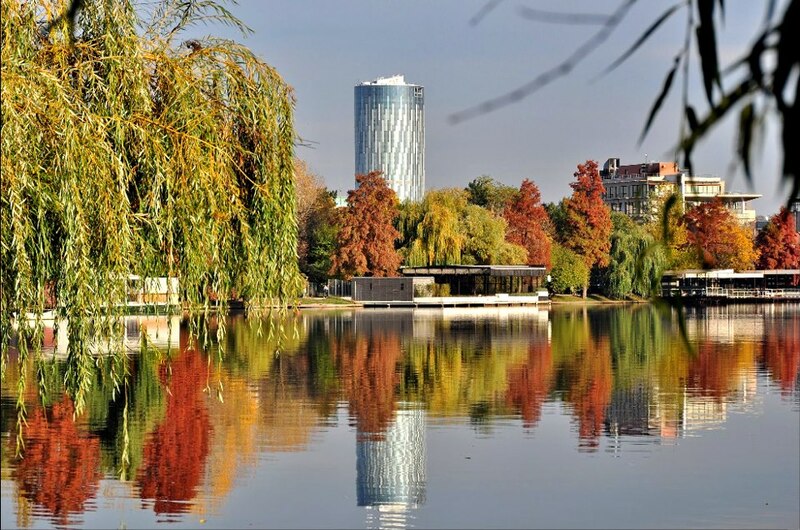 Another beautiful green place in Bucharest is Cismigiu Park, situated in the center of the city. Even if it is smaller, it also has a nice atmosphere. This is the first public garden opened in Bucharest. The name “Cismigiu” comes from an old word that describes the person who can build a fountain. In 1847 Wilhelm Mayer, the person responsible for the Imperial Gardens of Vienna designed the Cismigiu Garden. Nowadays this is a place adored by artists who have many outdoor painting sessions here.